1 What Is A Hammer Drill And When Should You Use One? 3.6 How Big Is The Chuck? Which is the best hammer drill for you? Today, we’re going to dive into that topic, beginning with what a hammer drill is and is not. Furthermore, we’ll go over the most important aspects to be looking for. I’ll give you a short history of some of the top companies that manufacture this incredibly useful tool. By the time you’re done reading, you’ll easily be able to pick the best hammer drill for your needs. I’ve compiled a helpful list of my top picks and will tell you the reasons why one of these should be in your tool chest right now! What Is A Hammer Drill And When Should You Use One? A hammer drill bores holes in the strongest materials. Masonry is no match for a good quality hammer drill. Even stone can be drilled into with this tool. But when do you need one? Well, honestly, most people don’t have one until they realize they need it. When it’s taking you minutes to drill a fraction of an inch, you probably need one. If you’re trying to attach something to a brick or concrete block wall, you probably need one, for instance. A regular drill’s motor will get burned out long before it will be able to punch into hard materials. Sure, you can rent one when that time finally comes. There are places which are more than willing to charge you a third to half the price of a new drill for a rental. But when you do need it, it’s a good investment so you never need to buy another one again. And if you’re going to drill into that block wall once, you might need to do it again! There’s a lot of different tools out there, so let’s clear up any confusion as to what each type is and how it’s used. Regular drills we’re all familiar with. These are the standard drill which can be found in virtually every garage. 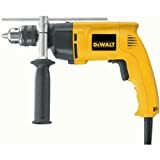 A regular drill can be used to drill a hole in wood, drywall, plastic, or other standard softer materials. The motor causes the bit to spin and the action of spinning bores a hole. However, most regular drills don’t have the power to drill into concrete or brick. A hammer drill spins like a regular drill. However, it also adds a forward percussive motion in conjunction with the spinning to go through harder surfaces. Hammer drills are meant for putting holes in masonry, concrete, brick, hardwood, or even stone. A hammering action like this breaks up the softer material beneath the bit. Then, the spinning action drills through the more solid material and ejects the debris from the hole. Here’s a great video showing the difference in functionality between a normal drill and a hammer drill. Both will do the job, but as you’ll rapidly see, the hammer drill excels at the task. Rotary hammers are similar enough to hammer drills that they’re often confused. However, they’re distinctly different tools. While both rotary hammers and hammer drills spin while exerting percussive force on the surface being drilled, the motors are very different. Hammer drills use a gear system to create the hammer action. They’re usually powered by electricity, either corded or via a battery pack. A rotary hammer, by comparison, uses pneumatics to power a piston, pressurizing and releasing it. That creates the hammering motion. Pneumatic devices like rotary hammers can exert greater power and go through thicker and heavier material. However, due to the need to have an air compressor, they’re often used by professionals rather than in the home. Finally, we have the impact drill or impact driver. From its name, people generally assume it’s the same as a hammer drill, but it’s very different! Where hammer drills bore a hole, an impact driver uses a mix of spinning and percussive force to drive a nail or screw into a surface. You can’t use a hammer drill to drive a screw into a particularly stubborn piece of hardwood. However, you can’t use an impact drill to actually drill a hole at all, only to drive items into a surface. There’s a wide range of options available in terms of hammer drills. Corded or cordless, various levels of power, even the size of the chuck used. Let’s go over some different options available on the market and discuss what you need to decide what the best hammer drill for your needs will be. You’ve basically got two options: corded, or non-corded. A corded hammer drill makes you reliant on a location where you can plug in. No power, no drilling! However, what a corded hammer drill provides is a consistent flow of power which never drains. Battery-operated hammer drills are great for portability. If you need to take your drill with you to a remote location, this is an easy choice. The downside is that the battery does drain quickly. As it drains, the power of the drill ebbs. You may want to pack a spare charged battery if you’ve got a big task to accomplish. Neither option is better than the other overall, but depending on your needs, either one might be the best hammer drill for you. Generally speaking, the more power your drill can provide, the less likely it is to blow out its motor. Also, the more power your motor has, the more you improve the overall speed of your task. Having said that, most people don’t need to fork out huge stacks of cash for the top of the line motor. For most DIY tasks, a motor that has about 5-8 amps of power is fine. Unless you’re trying to drill a massive hole into solid concrete, you’re unlikely to need it. 5-8 amps will provide you up to a half-inch hole in most hard surfaces without breaking the bank. While the motor power’s important, so too is torque. The term “torque” is used to refer to the twisting force that a motor can exert. The higher the torque on your drill, the more power it has behind that spinning action. Further, some drills have an average RPM count, telling you how many times your drill bit will spin per minute. Higher RPM means a higher count of rotations per minute. If that’s paired with a high torque, your hammer drill will zoom through those holes. Here we find one of the times when a corded model has an advantage over a battery-operated model. Corded models usually have a much higher RPM as they’re not limited by their battery power. Where you’ll get 1500 RPM on a battery model, most corded hammer drills will get 2500-3000 RPM, effectively doubling the speed at which it’s boring the holes. The best hammer drills have the option to reverse the direction that it’s spinning the bit in. This may not seem like a huge thing, but it can be. If a bit gets stuck in the hole you’re drilling, sometimes you simply have no other option than to reverse the spin to extract it. For most DIYers, a single-speed hammer drill is all you need. These have a uniform RPM rate and torque. These are generally fairly light in terms of weight, but they work fine. However, if you don’t mind a little extra weight to hold onto, there are two-speed hammer drills. First speed or first gear focuses on torque, dropping the RPM a bit. Second speed gives you better RPM, but drops the torque a bit. These two-speed hammer drills can easily replace your standard drill, as second speed is all you need for wood or drywall. 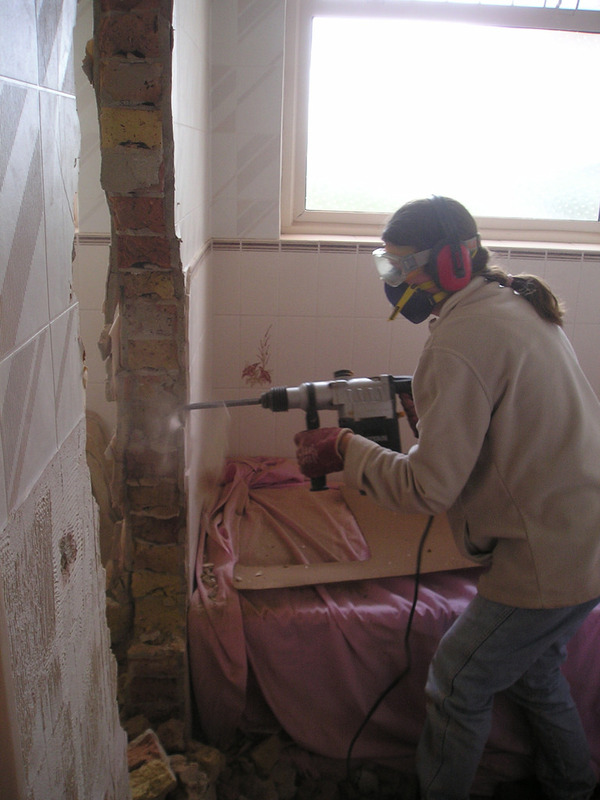 First speed is meant for drilling heavier stuff like your block wall or brickwork. How Big Is The Chuck? Chuck size determines how big of a bit you can use, as the chuck is what holds your bit. Most chucks can handle bit sizes between 1/4″ and 5/8″. There’s also two varieties: keyless and keyed. Keyed chucks require a key to remove or tighten the bit in the hammer drill. Keyless chucks do not require a key and tighten around the bit in another fashion. Do you want to have a light that reveals when your drill is plugged in? How about a chuck key that’s secured to your drill so it doesn’t get lost? A depth-stop rod that helps you determine when your hole is deep enough? More importantly, do you want comfortable handgrips that help you keep your grip when you’re drilling a particularly stubborn hole? Anti-vibration grips, balanced weight, and simple things like being able to read the direction markings on a drill are all a benefit to the user. Safety features add a lot of value. While there’s a lot of bells and whistles on the market, it’s important to pick the important ones for user comfort and flexibility. Be sure you have a secure and comfortable grip, and if it’s an anti-vibration grip, that helps reduce user fatigue. 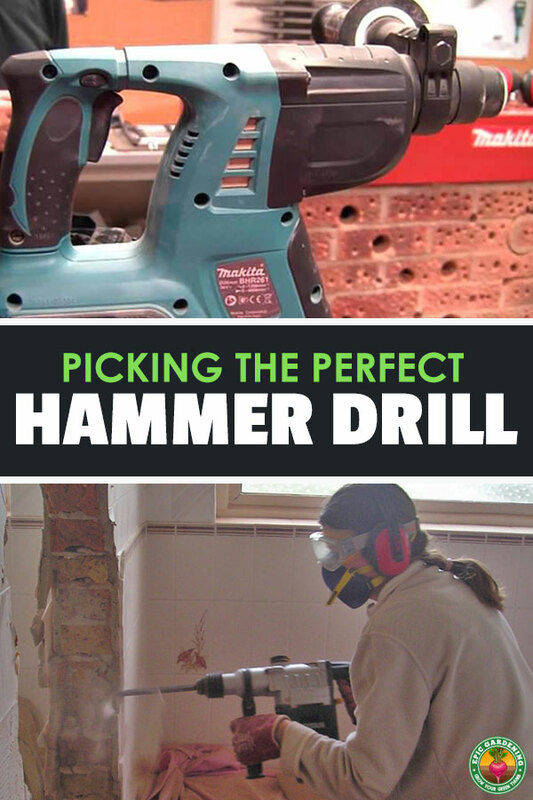 Consider a hammer drill which is balanced comfortably for how you’re most likely to use it. I recommend choosing options like a depth-stop rod so you know when your task is done. It’s easy to overlook these key functions, so be sure you watch out for them! When choosing the best hammer drill, it’s important to be sure that the one you choose has a few important things. As mentioned above, safety is key, but these three things are vital. First of all, be sure that your drill is balanced well and is not overly heavy. While the weight of the drill will vary depending on the model, it needs to be a comfortable weight for you to use it properly. Ensuring it’s well-balanced will add to the stability of the drill in your hands. The lighter it is in terms of weight, the less arm strain you will experience while using it. Furthermore, look for added features that make it easier to use your drill in a safe fashion. For instance, most drills activate by pulling a trigger. Some models are available with a lock-on trigger, which is great for deeper holes. These allow you to lock on the trigger and then reposition your finger, ensuring a more secure grip on your hammer drill. Finally, consider a hammer drill that has a second handle. These drills allow you to have both hands positioned safely on the drill and give you greater maneuverability. At the very least, get one which has a soft grip, as that allows you a more secure grasp on your tool. But whenever possible, get one with a secondary handle that gives you that extra control. Let’s go over some of the better-known hammer drill brands and take a quick look at the companies themselves. In the 1880’s, Robert Bosch founded the Bosch company in Stuttgart, Germany. By 1906, there was a limited presence in North America for the manufacturer as they began expanding worldwide. Bosch is currently a strong name in the tool industry. Bosch builds everything from small hand tools like drills all the way through commercial-scale shop equipment such as band saws and table saws. Makita was founded in 1915 in Japan, and the company has garnered a worldwide presence over the years. The company began as a repair shop for electrical equipment, but in the 1950’s transitioned into manufacturing their own line of corded tools. 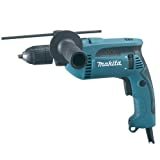 Makita’s power tools are well respected in the marketplace, and are typically in the midline price range for the category. One of their claims to fame is the creation of the first battery-operated drill in the 1970’s, launching the cordless power tool into the public eye. Their yellow-and-black coloration is immediately identifiable, and for many people is a visual cue of the construction industry. Raymond DeWalt perfected his first woodworking machine in 1922, and founded his Pennsylvania company two short years afterward in 1924. Since then, DeWalt has become a name amongst contractors and laymen alike, known for the sturdiness of their U.S. built tools as well as for their community involvement. The Ryobi Seisakusho Co., Ltd was founded in 1943, producing die-cast printing presses and similar machinery. They didn’t get into the power tool market until the late 1960’s. Since then, they’ve partnered with Home Depot as a primary vendor, and have become well-regarded amongst the DIY market. Ryobi tools offer a reasonable entry price point for those who need to do basic maintenance tasks without sacrificing functionality. Since their 1924 founding, the Milwaukee Tool Company has had a major focus on tradespeople. Their catchphrase, “Nothing But Heavy-Duty”, offers a strong view of their core philosophy. Milwaukee produces nothing but tools meant for heavy-duty usage, including popular tools like the legendary Sawzall series of reciprocal saws. In the drill industry, they’re legendary. Creating the first powered drill that could be operated one-handed early on in their company’s history, Milwaukee cemented their place in the market. Now that you know everything about what you need to be on the lookout for, let’s go over the picks I have for best hammer drill and their specific features! First things first: this DeWalt hammer drill offers the strongest motor out of the options I’m presenting today. 7.8 amps of power gives you the ability to do hard tasks as easily as lighter ones. But let’s not stop there! It has a secondary handle which can be rotated 360 degrees, enabling you to have a secure grasp on your tool no matter what position you’re working in. Multiple speed options give you flexibility and allow you to drill easily on different surfaces. It has dual mode functionality, enabling you to use it as a standard drill when you don’t need added percussive force. This corded hammer drill is 4.3 pounds, making it a comfortable and manageable weight when operating it two-handed. This is also the best hammer drill for concrete among my selections, as it has a 5/32 to 3/8″ width capacity when drilling into concrete. That’s a good range to work in without blowing out your motor. Without taking the next step up to a professional rotary hammer, the DeWalt gives you great drilling power. It’ll handle everything from concrete and masonry to steel and wood, and is my top pick for the best hammer drill overall. Most DIYers don’t want to spend a lot of money, or are working on a limited budget. So it’s important to get a tool that has multiple functions at a reasonable price. This Ryobi hammer drill offers precisely that. With three separate operating modes (drill, driver, and hammer), it gives you a wide variety of functions that it can do. It’s two-speed, giving you the choice of torque or RPM priority. The secondary handle is comfortable and easy to grip. It’s a very manageable 3.8 pounds, making it among the lighter options. As part of the ONE+ system, batteries for this cordless model are readily available and are interchangable with a wide number of power tools. I have parts of the Ryobi ONE+ series and they’ve been wonderful for light around-the-house use. If you’re a contractor or are looking for something for serious heavy-duty labor, this might not be for you. 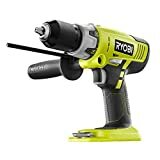 But if you’re looking for a hammer drill to add to your DIY tool set in the garage, the Ryobi should be a perfect fit at a good price point. While it’s easy to fumble around and find another drill bit when we need it, it’s frustrating when your chuck key is nowhere to be found. Thankfully, Makita has given us a good choice for a keyless chuck system, sparing us from running to the hardware store mid-project. Even better, the Makita hammer drill is a great drill. This 3.7 pound corded model has a 6-amp motor, providing good power. The secondary handle is positioned on the left, putting the trigger in the right hand for right-handed folks, and it has a comfortable grip. The user has the choice between two modes of operation: rotation-only, or hammer/rotation. This provides the ability to use it as a standard drill for wood, drywall, or other lightweight materials in addition to masonry. Makita advertises the ability to use up to a 5/8″ bit for drilling concrete. Anything over a half inch is going to be tough on a 6-amp motor, so I recommend sticking with smaller sized drill bits. Give it a break between larger sized holes so you don’t risk motor damage. All in all, the Makita offers people who want keyless operation a great product, putting them high on my list. Have you ever looked at a tool and loved everything about it, except one thing? That’s where I stand with the Milwaukee hammer drill. It’s almost perfect… but not quite. Don’t get me wrong, there’s nothing bad about it. It’s among the top classed cordless units at 1800 RPM, and has great torque too. Weight is great at 3.4 pounds. Multiple operations and multiple gears offer a wide range of capability. It also has an overload system that will shut down the motor when it’s at risk of getting overheated, which is a plus. My biggest complaint is that it’s too compact. That’s a perk too, especially when working in tight spaces. If you’re going to be working in close quarters doing electrical work or something like that, this may be perfect for you. Because of its compact nature, it loses the option of a secondary handle for a stable grip, and I really miss that. If it had it, this would be a contender against the DeWalt for best hammer drill overall. For what you get, the Milwaukee is an incredibly-solid, American made hammer drill that will work its hardest for you. If you’ll be working in confined spaces, this is your drill. I both like and dislike this drill for one major reason: it’s heavy. The Bosch hammer drill has a great 7 amp motor. It’s got a 360-degree auxiliary handle. It has rotary or hammer/rotary operation choices. It’s corded, comes with a solid case, and while it’s a single-speed model, it certainly has the power to do its job. But it is heavy. Shipping weight with case, drill, and a depth gauge is a beefy 7.2 pounds, and the case really doesn’t weigh that much. This is at the top end of my drill picks for weight. Unless you’re prepared to handle that weight, you may want to consider another model. This is still a great drill and a solid choice. I wouldn’t turn my nose up at one if it were given to me! But given a choice, I’d pick something a little bit lighter to reduce fatigue during use. All in all, DeWalt won my pick for the best hammer drill available today. I can’t fault a single thing about that drill. It’s definitely the best hammer drill for concrete, and it can handle basic tasks with wood or other light materials too! Whether you’re installing a pull-down potting bench or trying to anchor your new greenhouse to its poured concrete base slab, the DeWalt can handle it. Do you have a different choice as the best hammer drill, and if so, why? Let me know in the comments! This is a B@d A$$ drill. It does everyhting I need it to and more. Could not decide between it and the makita Model # HP1641K. SO glad I chose this, it rips thru CBS buildings like it’s nothing !! Glad that the DeWalt is working out for you! It’s got a fantastic motor and should serve you really well. 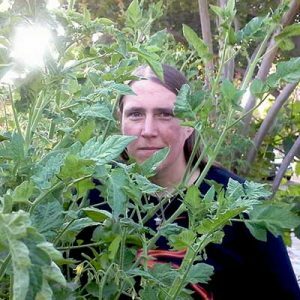 Great well-written comprehensive review – better than reviews done by bloggers specializing in tool reviews. Please do more tool reviews. They’re all good. I personally adore my SDS Plus drill from (don’t laugh) Harbor Freight. I paid a little over $60 for it and it eats reinforced concrete like cream cheese. LOL “like cream cheese.” Love that phrase Dave! Right, butter is so over used!